The first three steps for this bead embroidery tutorial were posted last week and can be found at the link! 4. Sometimes the simplest solution is the best! 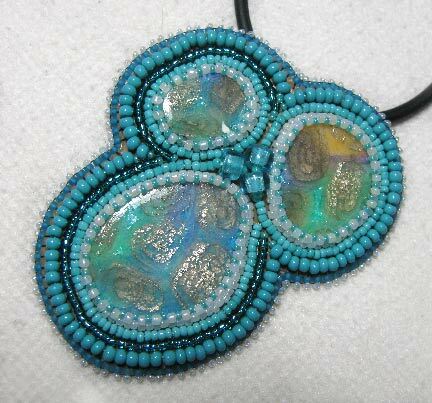 Last week I was left wondering whether to add more accent beads around the outside of the design as well as in the middle. Obviously I decided no. 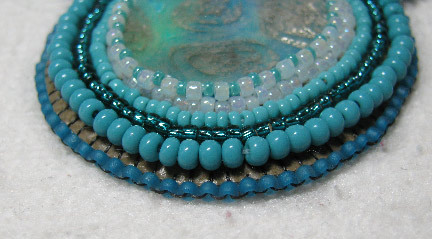 The cabochons are pretty busy, and I really didn't want to stitch something that would detract too much, so I added a row of silver-lined size 11/0 seed beads plus a row of size 8/0s in the same color as the first row of back stitched outline beads. Then I cut out the piece and cut a backing piece of fabric to match. 5. Edging brick stitch all around the outside, through both layers of fabric to hide the stitching on the back and to finish the raw edge. 6. I added only one size 15/0 seed bead to each edging stitch. Can you see the thread colors? Step 5 was done with dark thread, while for Step 6 I switched to white. 7. Stitch a square stitch bail on the back of the piece. You could do this before doing Steps 5 and 6, but sometimes it is a bit difficult to judge exactly where to place it so your piece is balanced when it's asymmetrical like this one. I just stick a beading needle straight into the back and let it dangle until I find the right spot. 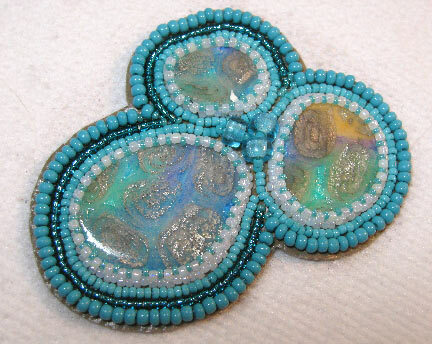 This is a lovely piece and the addition of the #15 beads on the edge is perfect. So nice of you to share your talent with us!!! Thanks! !